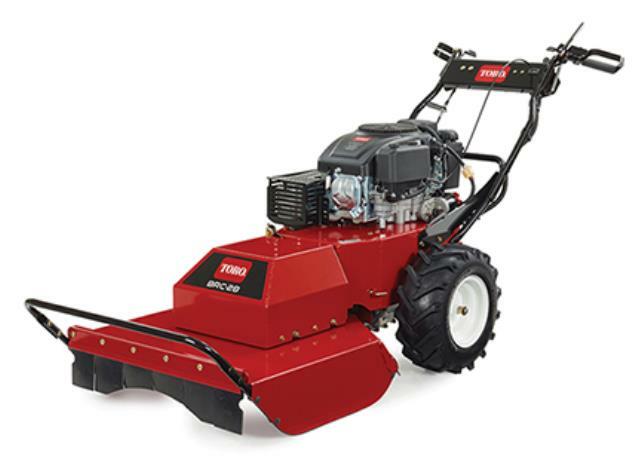 The Toro BRC 28 brush cutter is a commercial grade walk behind hydraulically driven brush mower. This machine allows operators to level brush, tall weeds, saplings and heavy vegetation up to 2 inches thick. It comes with a 28 inch cutting deck that uses high strength flail blades that can handle the toughest jobs. The Toro brush cutter uses a pivoting deck for easy navigation over uneven terrain in both forward and reverse. Superior product designs include a high strength steel deck, 1 3/8 inch spindle shaft and large diameter pulleys ensuring a long lasting machine. * Please call us with any questions you may have about our toro brush cutter rentals in Dallas and the DFW Metroplex.